Other than those with life cycles shorter than one year, most marine residents are present year-round in tide pools and subtidal habitats in Bamfield. 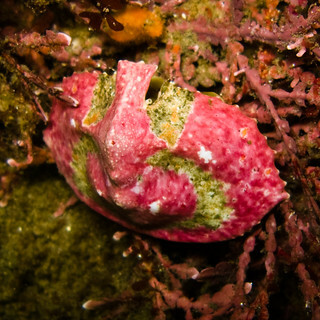 However, as you go tide-pooling this December, keep an eye out for these particular animals whose appearances rival that of the Christmas decorations you find humans have put together on land. This bryozoan forms spiral tree-like spires and looks like a beige grove of Christmas trees. Find animals living on the bryozoan (called “epibionts”) and you even have decorations! 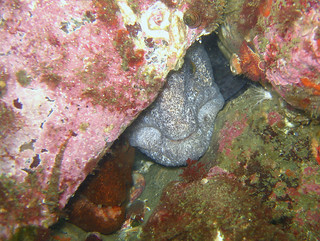 Image credit: Steve Lonhart (SIMoN / MBNMS), from Wikimedia Commons. These colorful snails are brilliantly gilded with orange and purple spirals, making them look like beautiful ornaments for decorating a tree. 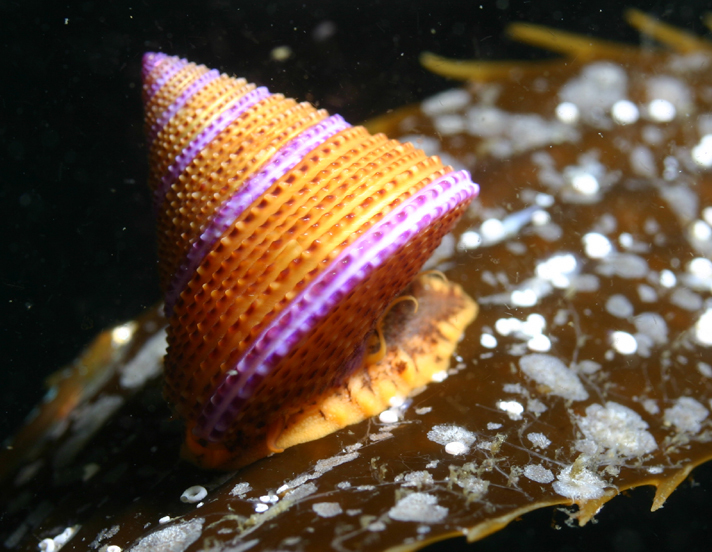 Calliostoma annulatum are found from tide pools down into subtidal kelp and rocky reef habitats. I’ve seen them both in kelp reefs and urchin barrens, and they are quite abundant in Barkley Sound. 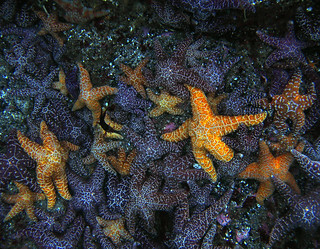 These sea stars come in a variety of colors, mainly shades of purple and orange, and resemble the star that tops Christmas trees on land. Pisaster ochraceous lives mainly in the intertidal zone, where it is an important predator, responsible for enhancing diversity in an area that would otherwise become dominated by mussels. Like so many attendees to Christmas parties, these animals are adorned in red and green, sometimes tastefully, and other times in a cheesy way (again, just like humans). Salmon are anadromous, meaning they live in the ocean for much of their lives, but return to rivers to reproduce. 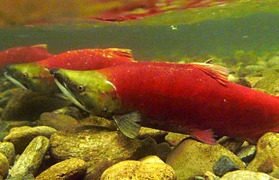 The sockeye salmon is silver with a blue back while it lives in the ocean, but in the fall adult males turn red and head up rivers to spawn. The green head ties together with the red body for a festive holiday look. 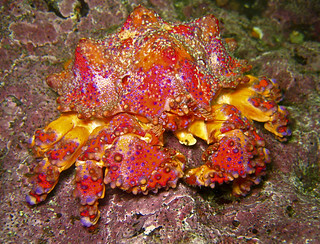 Umbrella crabs come in a variety of colors, but every so often you find ones that are pink with green patterns dotting the carapace, like a gaudy holiday sweater. The wide carapace hides the softer, more easily damaged appendages beneath. This crab lives in the Pacific Northwest and is quite good at blending into the background. This may come as a surprise, since once viewed under strong sunlight, its colors stand out as brilliantly as any Christmas lights decorating a home. Bah humbug! The wolf eel is like the great-uncle who comes to the holiday parties and then grumbles about how overcooked the roast is. Wolf eels might not be caught at a holiday party though–they tend to be territorial and remain in the same area most of their lives. There are loads of other animals, and probably seaweeds too, that deserve to be added to this list. Vote for your favorite 2012 Bamfield holiday creature, and consider recommending another either in the poll or the comments section below!